Today was my first hill walk. 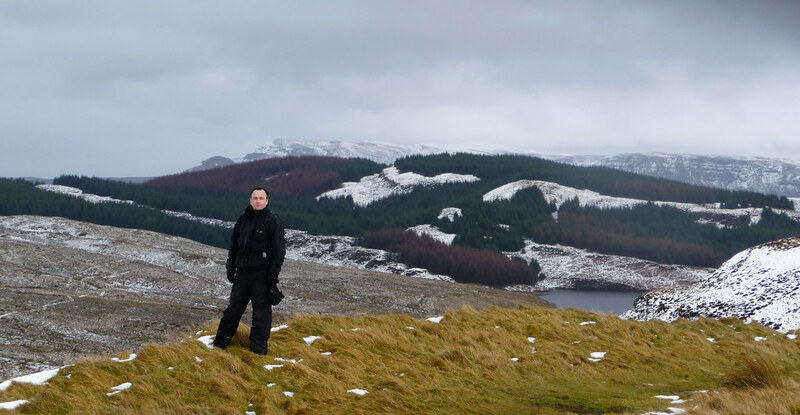 It was a walk in the Kilpatricks, Cochno Hill and Jaw Reservoir to be precise. Myself, Danny and Jim set off around 11:30 in drizzly rain and a small breeze. 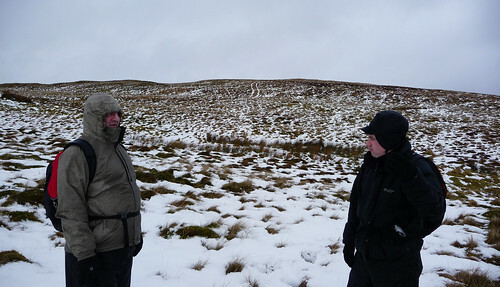 By the time we got to the top of Cochno Hill we had been through strong winds, heavy rain, hail and snow. Nevermind, the sun came out eventually! The route is based on one of the walks in the book Glasgow: 40 Town and Country Walks which is a great little pocket sized book for beginners like me. We set off from Duncombe Avenue (safer parking for the cars) and it wasn’t too long before we were walking up through some fields. The rain started to get a bit heavier at this point and looking further ahead you could see some lying snow. Glad I took Danny’s advice and stuck on my waterproofs. 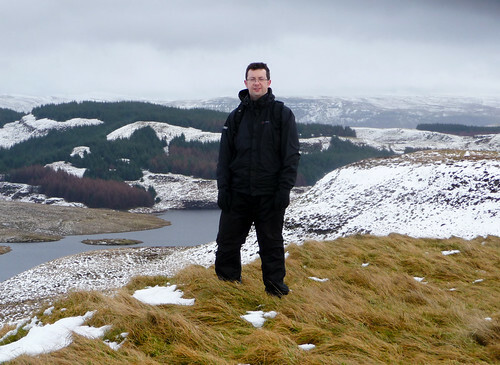 The ground was pretty muddy around here and on the way up to the first point of interest – Grey Mare’s Tail Waterfall. Wasn’t the biggest but it was nice to see and the first major waypoint on our walk. 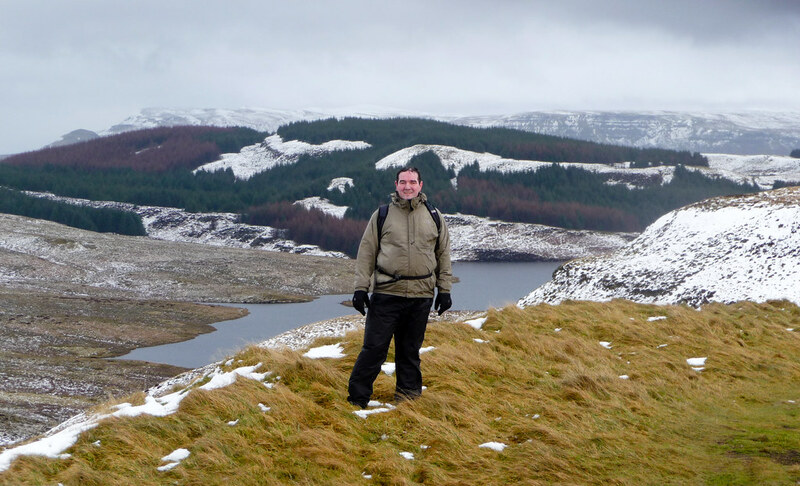 We kept climbing up to Jaw Reservoir. By this point the wind was really starting to whip up and the rain/sleet/snow/hail was starting to sting my face. The photo doesn’t really do justice but the water was being whipped away from our standing point. 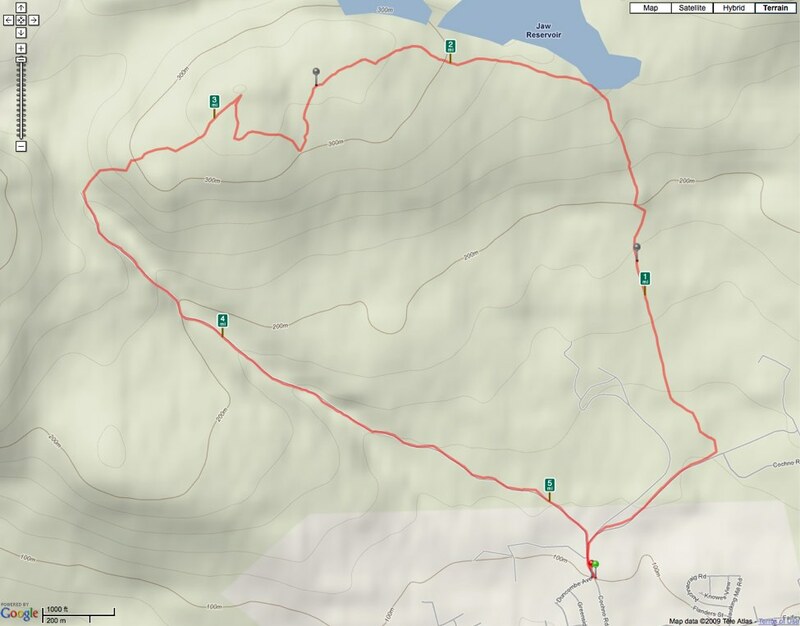 We followed the reservoir round to supposedly reach Cochno Hill summit but we walked off the path and detoured slightly but we got there in the end after quick stop in a little sheltered valley. Time for some hot soup! We walked to the hill summit and by this time the wind was dying down, the rain and snow had passed through and there was the first sign of some sunshine. The views were good but limited due to the weather. We walked over to the northerly side of the hill and got some good shots of each other. We then starting to head down the east side of Cochno towards Greenside Reservoir. A very slippy and muddy descent meant we took our time – no point doing anything silly at this point. We then followed Loch Humphrey burn, descending all the time back to Duncombe Avenue and our cars. Despite the weather it was fantastic to get out and about. It was a good test of all the gear I’ve picked up. Despite the weather I kept warm and dry. I was pretty surprised at how good the waterproofs were and also the wicking shirts which kept me dry. The shoes were excellent although my heels are a little sore as they haven’t broken in properly yet. The full set of FLickr pics can be found here. 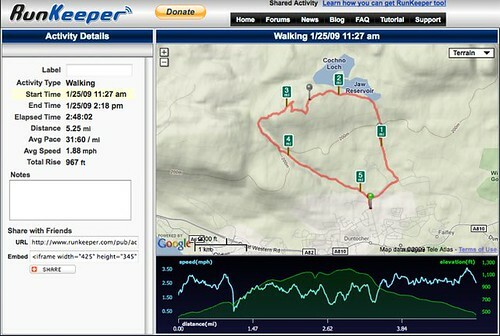 The iPhone also worked well using Runkeeper. It accurately tracked the entire walk. The only thing I have to remember is to pause it when we stop or take a couple of minutes to look at the map. The only snag is the battery life. I had the iPhone fully charged and it was down to under 10% by the time we had finished and that’s was with wi-fi disabled. I’ll be ordering a battery pack which will hopefully arrive in time for next weekends walk which is double the distance. Just need to try and keep it dry – in the paclite jacket condensation was forming in pockets so I’ll need to keep the iPhone and charger in a bag. I was also surprised at how quickly, on a small hill, the weather changed and drew in. We had maps and one of us has done lot’s of walking but it was an eye opener at just how quickly the weather can change and disorientate you. Next up is Dumgoyne starting at Strathblane. Higher and longer than today…and my legs are aching right now. Can’t wait!